Category Archives: Let what matters be your composition. Let what matters be your composition. An evening of night terrors means I go to the gym at midnight. I lift until I’m tired and my eyes are heavy-lidded, and then I come home. I really thought my epoch of loss in this new era of being an amputee was over. Not so much. This is still a storm of grief. A colleague once said to me that dysfunctional environments lead to minutia becoming important, like debating the merits of open-toed shoes in a workplace facing a funding crisis. The same holds true for our lives, when something hits us hard and threatens to destroy us. If recovery becomes too big, we focus on the small, or stupid, or unimportant. I fell down that well–see my last three posts; selfish privilege, cruelty to animals, self-immolation and blind spots press my buttons hard. Not my circus, not my monkeys, and I’ve got eighteen deleted and gross comments in the form of hyperbole, death threats, physical admonishment, and comments about my family members from six authors that teach me exactly that lesson. I’ve also learned how to block IP addresses, so I don’t even have to read the hate speech before it disappears into the masturbatory ether in which its authors dwell. The urge to print it out and mail it to the parents of the senders is pretty strong; no one needs that toxic, abortive garbage, though. It’s a really easy way to ignore the life raft you’re on by focusing on the already drowned. Short version: I’ve got a pretty great life. I just stood up at my best friend’s wedding as the Best Man, something I thought I’d die before doing a few months ago. I’m a leg down and I didn’t die. I’ve got a job I love and my health improves every day. I’m writing all the time and people are able to read and interact with my work. I don’t have a lot to complain about at the moment, beyond the wonky shoulder I gave myself from too much time lifting too much weight tonight. 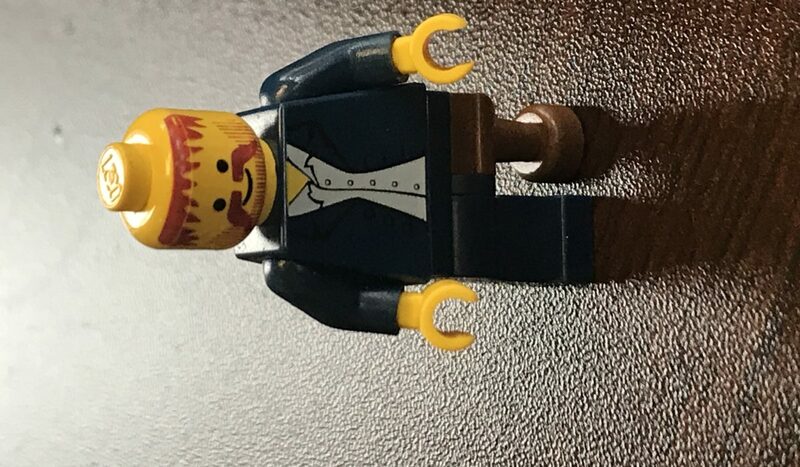 There’s a young woman in my limb loss support group who knows about my love of Lego; she’s built me out of spare parts twice, once in the wheelchair and once newly-legged up (above). We find little joys to swap and laugh about amidst the awful crap that happens to us and that’s how we’re reborn. I have to keep reminding myself that we’re an Easter people, and rebirth and regrowth are part of this story, and nihilism is gross, and navel-gazing in too much focus is equally gross. I’m really trying to build new connections and give this life of mine meaning through the people I connect with and change me, even as I get chances to change things around me. Not dying in early January requires some rent paid somewhere for all this bonus time. I’m trying to balance that out. It’s Friday the 13th and it’s the first day of the year that really feels like fall; there’s something to cherish in that. I’ve managed to avoid pumpkin spice anything thus far, and I’m chaperoning a haunted hay ride with a dear friend/ex-boyfriend next week, which is one of my favorite little pangs of nostalgia. You work hard, you find things to value beyond yourself, you acknowledge that none of this is about you, and you plan to stick around, and good stuff tends to happen. So, maybe we go for more of that. More life.